A few days ago, I arrived home from Nashville, Tennessee. I went to my best friend from high school; it was her bachelorette party. It was a blast, and I am very happy that I was able to spend time with her before her big day coming up next month! The only downside was that downtown Nashville does not like plant based food, lol! Thank goodness I found a local juice bar, but the majority of places have not caught onto the vegan scene yet. We had brunch one day at a trendy local Nashville spot, and I was totally in love with the sound of “Red Velvet Waffles” and “Nutella Pancakes…” O.M.G (whhyyy do they not have yummy vegan food, I am thinking to myself!!) I settled with a kale and barley salad, and was underwhelmed to say the least, lol! Anyways, it is times like this when my mind starts churning. What do I do? I come up with my own homemade NUTELLA, or “Not-ella,” as soon as I got home! This is your new bestie! 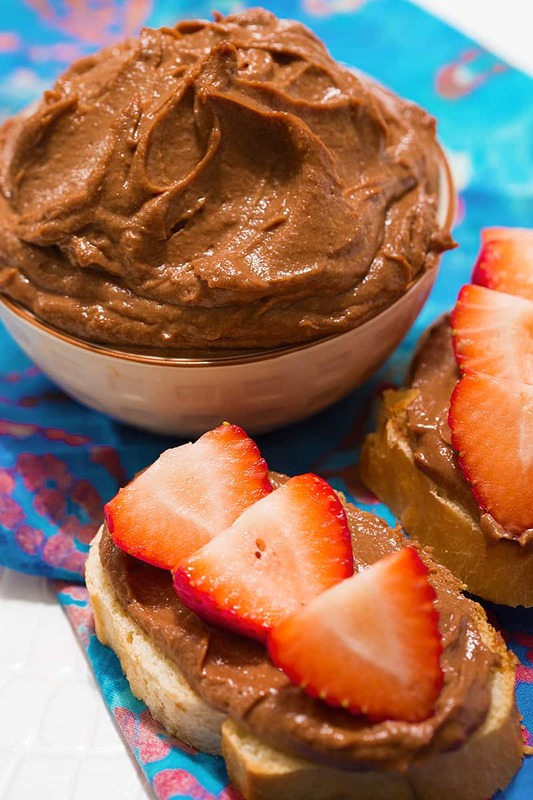 With only a few ingredients, you can easily have healthy, dairy-free, and refined-sugar free, hazelnut spread at home! Try this on toast, homemade pancakes, as a cupcake icing, or basically on whatever your heart desires! Speaking of that, my next recipe coming up is an oil-free, french toast with tiramisu cashew cream & not-ella! YUM! Blend all ingredients together in Vitamix until smooth! You can use raw hazelnuts in this recipe, but it won’t have the same roasted nutella familiar flavor. If you choose to roast your hazelnuts, please make sure not to burn them! If you burn them, it WILL affect the flavor. Read HERE on how to roast hazelnuts. (Any leftovers are great for snacking, and they keep for a long time). Hi Francesca! Thank you so SO much! Yay for healthy life! XOXO!